Kjellquist Blog » A REALLY Dark Territory!!! Dark Territory is a very readable non-technical account of the history cyber warfare, attacks (both on the US and by the US) and the political machinations of the past 20+ years. 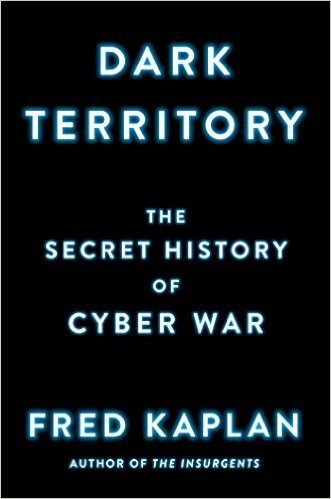 Though Kaplan presents a straight forward history of our cyber environment, the implications are down right frightening. In much of Dark Territory there is a discussion of the political state of cyber warfare. For example, our current state of affairs in cyber warfare is likened to the very early days of the nuclear era right after WWII. At that time political leaders grappled with issues such as what circumstances would justify a nuclear strike. Over decades, there evolved policies by all nuclear nations that have precluded a nuclear confrontation. The leaders of nearly every government are in a similar state for cyber warfare. However, unlike a nuclear attack there maybe no immediately known perpetrator. Nearly, all attacks are intended to disguise their source. Another significant difference is that cyber warfare can be waged by almost any nation-state and even non-state actors. Even a simple question as to what constitutes cyber war is difficult to answer. For example, was the physical destruction of thousands of Iranian nuclear centrifuges by the Stuxnet computer virus an act of war? What was appropriate for an Iranian response? In the case of the North Korean hacks of the Sony Corporation, what is an appropriate response to an attack designed to influence the behavior of a corporation? Of course, no matter the answer to these kinds of questions; there is always the risk of an escalating response and counter-response with ever increasing severity of consequences. Dark Territory is mostly a history. Kaplan does an excellent job of recounting several cyber attacks on the US with code names like eligible Receiver, and Moonlight Maze, As well as our cyber attack, Olympic Games, on the Iranian nuclear centrifuges. In general, Kaplan does not pull any punches. He names names and attribution of motives across the US security organizations. It is clear that Kaplan has had the advantage of non-attribution interviews of the key individuals in this history. The overall conclusion that the reader will draw from this book is that there have been some visionaries that see the dangers of our cyber environment. However, in nearly every case these visionaries have been ineffective in getting our government, military or commercial institutions from taking the threats seriously. This despite examples of actual attacks. Dark Territory should be a belated wake up to cyber world we live in. Posted: March 24th, 2016 under Books.